September is all about charity knitting for us. It is this year’s Commit to Knit month when we ask knitters and crocheters to commit to making one item for crochet during the month. We know lots of you already donate your skills to crafting items for charities nationwide. There are at least 6 million people who can knit or crochet in the UK. Just imagine if each of them made one item for a charity. This would mean a massive boost in items to sell, to raise money, and for charities to distribute to those in need of warm clothes and blankets in this country and abroad. To celebrate Commit To Knit, we have created seven patterns to inspire to get you started plus there are more patterns and links on our website. You can download the booklet of new patterns here. 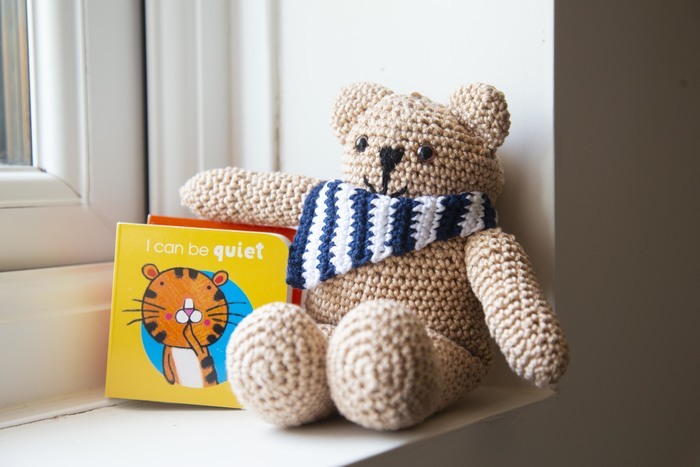 Among the patterns are two blankets, knitted and crocheted – these are popular items with refugee, children’s, homelessness and animal charities. Plus they are a great choice for knitting groups because you can all work together on a large blanket. Warm items like our hats and mitts are also popular with homelessness and refugee campaigns. This year’s hat and mittens could also be made to be sold to raise money. Our mitt pattern has fingerless and full mitten versions. This lovely crochet teddy is also something that could be sold at a fundraising event or donated to a children’s charity. Many thanks to blogger Emma Varnam who donated this pattern. You will also find patterns for mini Christmas stocking that can be turn into bunting, decorations or even mini gift bags. We hope you find something here to inspire you and your yarnie friends. We are really hoping that lots of the 500+ knitting groups around the UK will get involved and perhaps work together on project over the next few weeks. We will also be choosing a knitting group each month from the groups listed on our website to win yarn for their future projects. However you Commit to Knit this year we want to see what you are doing so please post on Facebook and Twitter to show us your projects.